Since I’m spilling some of my secrets this week I thought I’d share one that’s on the minds of a lot of aspiring writers, how I got my agent. The short answer is, I just kept going. That’s not helpful so to elaborate, I kept going to workshops on the craft of writing for commercial markets, critique boot camps, and conferences. Then I kept going back to my writing hidey hole to apply the lessons I learned. Along the way I earned a mentor. I say “earned” because I’ve found that no matter the career, there are always people willing to take a person under their wing but it’s a relationship that works only when the mentee acts on the time and effort graciously provided by the mentor. My early mentor, Michael Neff, is the director of Algonkian workshops and conferences, one of them being the New York Pitch Conference (http://newyorkpitchconference.com/). Michael invited me a year before I actually took him up on the offer. Why did I wait? Because I didn’t want to blow it. I wanted to walk in confident that both my manuscript and I were ready. An unrelated aside, you’ll note my fellow Miss Demeanor, Susan Breen, is also on the faculty at the New York Pitch. If you check out the website you’ll see this particular event is something a lot of us have in common 🙂 But I digress…. 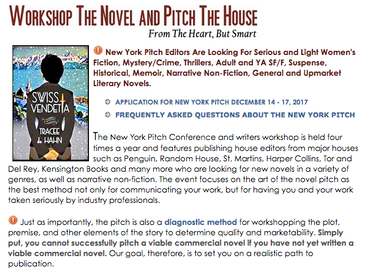 In the run-up to my trip to NY I studied the faculty that would be there, the agents, editors and authors who would be helping attendees hone their pitches throughout the event. Each genre has a leader and mine was Paula Munier. Something I’ve learned throughout multiple careers is that when someone you respect is willing to give you their time and energy, you listen to what they have to say. In addition to being an excellent coach, Paula has a pedigree that opens doors. I gave her my full attention. As a result, at the end of the long weekend I received read requests from every agent and editor I pitched. Was that all Paula’s doing? In large part, yes, but also it was my approach. I took this event seriously and treated it like a job interview. In essence, that’s exactly what pitches are. Like job interviews, I’m not only hoping someone finds me suited to them. It’s a 2-way street. I look for fit & chemistry, too. It’s not that I had any issues with the other agents I met but Paula and I hit it off right away. When I got her call, I didn’t hesitate. I signed with her immediately. So I guess the secret is, there is no secret. I got my agent through hard work and careful selection. And I just kept going.